Siding wraps your home in a protective covering, safeguarding it against the elements and helping to create a comfortable interior. 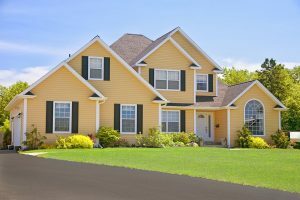 Because of the major role your siding plays in your home’s structure, it’s important to turn to a reputable company when it needs to be replaced. For homeowners in the Jersey Shore area, that company is Toms River Door & Window. We are a family-owned exterior remodeler that has been in business since 1971. Though we are quick to adapt to the times when it comes to technological advancements in our products, we do so while providing the same, old-fashioned service that we did when we first opened our doors. The siding we install is crafted by renowned manufacturer CertainTeed. We choose to partner with this industry leader because of the superiority and versatility of their products. Whatever type of house siding you’re looking for – vinyl, composite, polymer, or stone – you’ll find it among our impressive selection. If you’re not sure what type of siding is the best fit for your home, one of our expert consultants will help you decide. We’ll run a thorough needs analysis and provide recommendations that will meet your energy-efficiency goals, maintenance expectations, and aesthetic preferences exactly. There are multiple profiles available in each variation. You’ll also find an array of customizable options for your siding’s color and finish. Because the color is integrated directly into the material, you’ll never need to scrape or repaint, making this siding virtually maintenance free. Beautiful siding does little for your home if it isn’t installed properly, which is why we never trust our projects to subcontractors. Instead, we take the time to train our own in-house technicians. With our well-seasoned team on the job, you can expect a flawless installation that will bring lasting value to your home. Contact Toms River Door & Window today to learn more about the house siding we install, or visit our expansive showroom to see samples and meet with one of our representatives for a no-pressure consultation. We are conveniently located just a few miles west of the Garden State Parkway. With an in-house team of certified technicians, decades of experience, and a stellar reputation, it’s clear Toms River Door & Window is the company to trust with your exterior remodel. © 2019 Toms River Door & Window. All rights reserved.